Photo courtesy of Steve Finney. Sign found in Brooklyn, NY. The cashier in this shop is actually a jackpot machine. Round it anyway you like. Welcome to Non-Negative Real Number Cent Store. The Zen sign in the lower left explains everything. 99c or not 99c, that is the question. Satisfaction is and is not guaranteed. @jjhitt: It does either explain everything, or nothing! The one-stop shop for penny-thrifts and spend-pinchers. Do you have troble with indecision? Errr. Can I get back to you later on that? Okay, uh, how much for the Taj Mahal? Now how did I know it would be Brooklyn? Outside of NYC the are called Family Dollar stores. It is not a “language” thing, it is a “it doesn’t matter what the sign says, we sell cheap crap” thing. Family Dollar Store? I like it, spend your family of dollars here. This item over hear will cost you a family of 8. I’ll take a million of the 0 cent items. Did anyone else notice the spelling mistake – “everyting.” These guys get low marks for math AND English! Shop assistant: Yes that’s right, 99c, more-or-less…..
Or less&up – there’s more! Not sold in any store! Schrödinger gave up on the cat and went into selling things that are more and less than 99 cents. I don’t know. Technically this seems right. 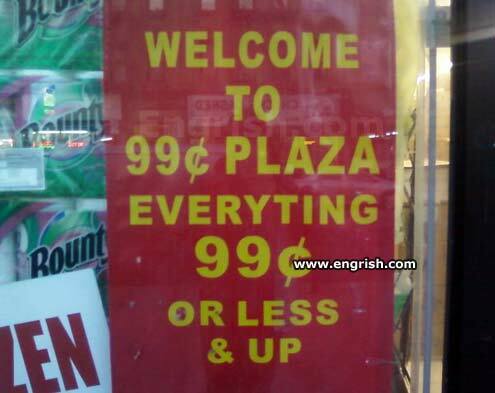 I think they mean everything is either 99 cents or less than 99 cents, in the total range leading back up to 99 cents? This is logically equivalent to “switching to GEICO could save 15% or more on car insurance”. Both are null statements. We truly need to bring logic back as a compulsory college course. But wait! There’s more! And less!!! Now its $1.30, now its 45c.. god when will I have to stop saying random prices? They sell things at basically any price! Oh shame on you America, even the Engrishers are laughing at you! Return policy is within but not before 30 days or months. No refunds after purchase.